When you get out of high school, you’re presented with limitless choices. You can go in any direction you choose. You can become an engineer, doctor, truck driver, or network administrator. Once you make your choice, you’re going down a path. You invest your money into education and training. Even more importantly, you invest your time into a career. The further you progress down the path, the more costly it becomes to change paths. But, what if you did want to try out something else? Even years into a career, nothing is stopping you from becoming a doctor. Or a truck driver. Or an engineer. Or a network administrator. Except, of course, another investment of time and money. That’s the hardest part of a career change. You’ve already invested so much into one path. You’ll have to start all over again. You may have to go back to school, and then find time to gain experience. You’ll start back at the bottom with an entry-level salary. That’s especially tough if you have a house, bills, and people who depend on you. It’s not just a career change. Everything changes. That’s basically what happened when the world moved to cloud technologies. The world spent years on one path — hosting their own apps, running data centers, and purchasing software by the truckload (rather than download). Then, rather suddenly, everything was upended with the cloud. Startups embraced the cloud immediately. Like the high schooler, they had nothing invested, so they could set out in any direction they wanted. Mature businesses and governments have taken longer to migrate. They spent decades and billions building their IT infrastructure the old way. They invested so much into one path, which makes it harder to start fresh. Arguably, the cloud is a better way, but it’s still hard to change gears. For IT professionals, the shift to the cloud has offered tremendous opportunity — as long as you’re willing to learn and adapt. No career change required. Businesses need people who know how to use these new tools. Whether you’re mid-career or just starting out, it’s time to learn the cloud path. In fact, you can get started right now with CBT Nuggets trainer Bart Castle. In this training, Bart will teach you how to develop the most essential skills for modern IT infrastructure. Before we get into the technology, let’s talk about your options. The cloud is all about choice. You have the ability to choose between deployment models, services, and even price. With choice comes flexibility. With flexibility comes the ability to work faster, and change directions quickly. Join Bart Castle in his yurt (yes, yurt) as he starts off this fundamental course on all the ways cloud computing creates options for businesses — and individuals. Video 2: What are Cloud Technologies? The cloud isn’t just one thing. It’s a whole array of services, and there’s something for just about everyone. 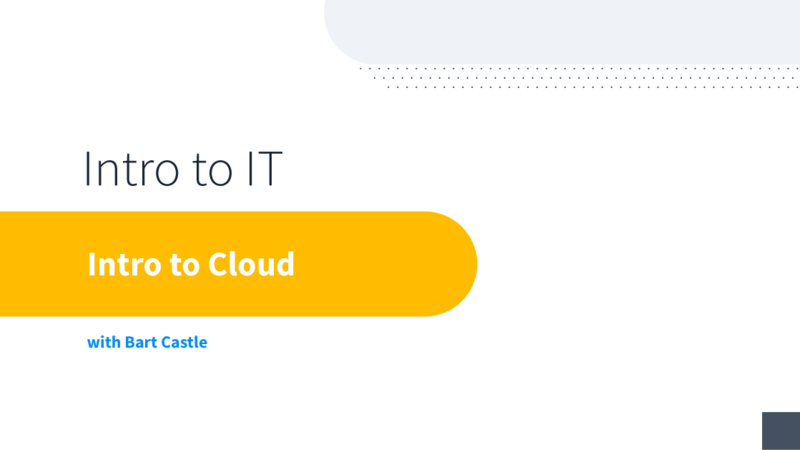 That sounds great if you’re a business looking for a cloud solution. It’s even better as an IT professional. If you choose a career in cloud technologies, there’s certainly something that will spark your passion. Video 3: What Cloud Jobs are Available? In just a few short years, entire sectors of IT, like virtualization and DevOps, have sprung up to support cloud applications and infrastructure. But that’s not the half of the cloud jobs out there. It’s hard to put your finger on the number of cloud jobs available. That’s because just about every IT job now has a cloud element. Video 4: What Cloud Skills are Essential? Choice has been the running theme here, but there’s one thing that’s no longer optional — learning cloud skills. What cloud skills in particular? That’s tougher to answer. It’s better just to jump in head first. When you’re learning any new skill, you’re going to start with the basics. That’s where you should start here, too, and Bart can guide you. Virtualization is tough to explain. Some people use the movie Inception as a reference. Others use the metaphor of a container ship. In this video, Bart uses a chaotic restaurant. Knowing how virtualization works will come with time. More importantly, you should know that virtualization is a core feature of cloud computing, and you’ll likely run into it on the job. Woodworkers use jigs and guides to make sure their cuts are perfect every time. Manufacturers use assembly lines to make thousands of products quickly and efficiently. IT professionals have scripts. As an IT professional, there are many things that require creativity, ingenuity, and focus. For everything else, there’s scripting. If you have to do a task more than once, script it. Just as people think of cloud computing as one thing. People also think of the internet as one thing, but it’s not. The internet is a network of networks, and networks inside networks. (Cue Inception again.) In the video after this one (Video 9) you’ll learn about the recipe for cloud computing. One of those ingredients is “broad network access”. That’s where wide area networking comes in. There are literally thousands of pages of ISO standards for the common bolt. The longer a technology has been around the better defined it becomes. So far, there are about 20 pages from NIST that define cloud computing. Every cloud service has these five ingredients. Bart breaks them down. Video 9: What are the Cloud Deployment Models? So far, we’ve been talking about the public cloud. But there are other options, too. After all, there are always options with the cloud. The public cloud is like when you buy electricity from the utility company. The private cloud is like going completely off-grid. The hybrid option is like installing a few solar panels on your roof. Community clouds are basically co-ops where you pay for the infrastructure and get a portion of the power. Bart goes further into these four models. Video 10: What are the Cloud Service Models? There’s one acronym convention you’ll see often in cloud computing — “as a service” shortened to “aaS”. Let’s go back to the utilities metaphor. The power you get from the electric company in this context would be Electricity as a Service. Your water would be Water as a Service, and so on. “As a service” indicates a specialized cloud product category, and NIST has counted at least a hundred service variations. (It’s all about options, right?) Ultimately, these fall under three categories Software as a Service (SaaS), Infrastructure as a Service (IaaS), and Platform as a Service (PaaS). Bart explains further. Cloud technologies are everywhere. This blog is hosted on AWS. This video is hosted on YouTube — a giant cloud service. You might have found this blog from Facebook, Google, or Twitter. All hosted on the cloud. When you complete this course and take the quiz, you’ll take it on a cloud service. It’ll be graded by on the cloud and sent to your email, which is probably also hosted on the cloud. You get the picture. IT is a career field that’s both deep and wide. It’s a huge world with many opportunities. You can specialize heavily in something like cloud network infrastructure, and that will look much different than app development. Your skill sets will be much different had you skimmed across the surface. That’s an option, too. Some people skim across the surface at first, finding their strengths, and then specialize. Others skim for an entire career. There’s no right answer here. Just know that you’ll run into the cloud whether you go deep or wide. The landscape has changed, and cloud skills are now essential. Validate what you learned today by taking the 12-question Intro to Cloud Technologies quiz. There’s one question from each video. Pay close attention. You need to get 100% to earn your certificate of completion. The quiz isn’t timed, so you can even go back.